Last Tuesday morning, I heard the news of a shooting at Reynolds High School in nearby Troutdale, Oregon. I didn’t think much of it. People I knew were posting that everyone they knew got out and was safe. Because I was working, I didn’t watch the news much. On Wednesday morning, I was with a client and happened to check Facebook to see if any other workers were doing something that might interest my client. When I opened the app on my phone, there was a picture of a young man I knew, Jared Michael Padgett, identified as the shooter. I knew from the news that the shooter was dead. I didn’t know Jared well. He is a member of the Church of Jesus Christ of Latter-day Saints and attended the same ward (congregation) that I do. The Sunday before, I sat in a Sunday School class for youth and he was there. He was smiling, friendly, and communicative. Everything I knew about him was from observation. He took his duties at church seriously. The reverent way he passed the sacrament was inspiring to me. It adds a certain boost to the Spirit in a sacrament meeting when the young men pass it to the congregation with reverence and dignity. He epitomized that kind of attitude towards it. The morning I found out he was the shooter at the high school, my knees went weak. Whenever I would try to speak, my words were mixed up. I couldn’t say whole sentences. I was more distraught than I could understand, given that the young man and I were barely acquainted. As I tried to explain it to others, I wasn’t really in touch with why it affected me so deeply. Certainly, part of it was just how close to home it was. When these events happen, I’m always affected. It makes me sad, but it always seems so far away until this time. Yet, even that wasn’t behind my deep feelings. All that week, I searched my heart for the source of my turmoil and grief. The events as described in the news were not consistent with the young man I observed and admired. It wasn’t until the funeral that I started to sort it out. The funeral was beautiful. For me, the highlight was the stirring violin solo by his sister, Maggie, who played, “God Be With You Till We Meet Again (LDS Hymnal, #152).” Several of Jared’s youth leaders and family members spoke about his outgoing and loving personality. I was not the only one that thought so highly of him. Everyone is puzzled about how this kind, respectful, and fun-loving youth did such a terrible thing. I don’t claim to know the answers to that question, but I do know why I relate. It has to do with dark thoughts and a reputation for good behavior. As a youth, I became to be thought of as a deeply spiritual young man. I was devoted to and knew the scriptures. People knew that about me. I related well to adults. I was liked and respected. As much as I enjoyed the attention, another part of me was uncomfortable with it. I knew someone they didn’t. I knew the boy inside with dark thoughts and desires to do things that he knew to be wrong. I wrote some of them out in a journal and was glad later that no one ever had a reason to read them before I destroyed them. One of the pitfalls of being around a lot of adults who think so highly of you is when you are having thoughts that don’t go with the things people say to and about you. It makes it pretty difficult to feel like you can process those dark thoughts with anyone without greatly disappointing them. I was deeply ashamed of my thoughts and feelings. I couldn’t risk telling anyone for fear of rejection and abandonment, two things I knew all too well and did not want to experience again. So, I kept these things to myself. Shame is dark, powerful, and compelling. It is so painful that when we experience it, we will do just about anything to take our minds off of it. When you’re young and when you’ve already known rejection and abandonment, the last thing you want to do is lay it out there for others to use as an excuse to separate from you. With shame, there are two basic options: share it or bury it. It seems that in our Latter-day Saint culture, burying it makes for what feels like a safer option.That’s the route I took and the result was personally catastrophic. It kept me from serving a full-time mission. The me I thought I knew was probably not so bad he couldn’t have gone, but I never let anyone tell me that I was a better man than I believe myself to be. Part of the internalization of shame and dealing with its pain is to embrace some of those feelings and try to tell ourselves that they aren’t so bad, that we have a deeper knowledge than other people. It feels better to tell ourselves that a thing isn’t wrong than to admit how wrong it is and how ashamed we are of desiring it. It takes a lot of maturity to choose the “share it” option, yet it is a far better path to take. There is something special and wonderful about verbalizing dark thoughts to someone you trust. There is no more effective antidote to dark than light. Bringing even the darkest of feelings into the light by sharing them can alter what we think of ourselves. I sometimes imagine how different my life would have been when I was a little boy if I had felt it was safe to talk about the dark things to the people that could have helped me. I had years of pain and separation from the Church because I preferred to hide my feelings and be away from the place that made me feel evil by contrast. Have you ever tried to explain something you’ve been worried about to someone out loud only to find that it sounds a lot less convincing as you speak it than it was when you kept it quiet? I’ve experienced this over and over and I’m deeply grateful to the people who have been willing to hear me out even when I’m saying the most outrageous things. We have a hymn that we sing called, “Lord, I Would Follow Thee (LDS Hymnal, #220).” One of its verses states, “In the quiet heart is hidden sorrow that the eye can’t see.” I’ve had that quiet heart and hidden sorrow. I wish I knew how to create an environment where young people with dark thoughts feel like they can talk them over with people who can help them. How much violence could we prevent if we were more open and young people felt they could trust us? How much pain could we soothe if young people who have experienced abuse felt they could tell us about it? I know that one thing that helped with my own children was for me to be open about the struggles of my youth. I don’t know that it really serves the cause of parenting for parents to seem like they have never done anything wrong. We don’t need to dwell on our mistakes, but how can we credibly talk about the power of the atonement to cleanse sins and heal hearts if we give the impression that we’ve never sinned and never had a broken heart? I believe that it would help for us to talk more kindly and generously about people around us who make mistakes. It is possible that the dark thoughts a young person is harboring are very much like something they’ve heard us loudly condemn with great conviction. It is fine to call sin sin, but if you listen, most people condemn sinners, not sins. How we speak of people who make mistakes has a great effect on how young people think of people who make mistakes. I hope that when adults talk about right and wrong, they are clear about the difference, but always, always, always speak with compassion about people who do wrong things. The same hymn also says, “Who am I to judge another when I walk imperfectly?” I think that if we ask ourselves that question aloud with more conviction, we will set an example for young people that is more righteous, more Christlike than any sermon against sinners could ever be. Posted by Rex Goode under Abuse,Depression,Inspiration,Pain,Support,Tolerance. I thank you for these words, they rang true about Jared as I read them. We used to live in the Hartley Park ward until 3 yrs ago. Jared was my son’s best friend. We’ve known him since he was 8 yrs old. My son and Jared went through cub scouts and later Boy Scouts together. Jared came to my sons birthday party last October. The Jared that is portrayed on tv is not the Jared we knew. He was loving, funny, respectful, and just a good boy. We have had a very hard time since we found out Jared was the shooter on Tuesday afternoon. My sister found out and called me so that I could tell my son before we heard on the news. That was the hardest thing I’ve ever done as a mother. In the last week with all the talking and crying we’ve done, not one of us has been able to figure out why he would do what he did. It didn’t make sense. We couldn’t grasp the fact that our Jared did that. We had these feelings confirmed by our friends that knew him and even kids at his school that didn’t know him as well as us. In reading your article is seemed to make sense. When the news came out with the story of what was written in his journal, I wouldn’t believe it. The Jared I knew wouldn’t write or think something like that. He proved to me last Tuesday that I didn’t know the whole Jared. I have thought many times, as my son to has wondered, why couldn’t I have seen something and been the one he would talk to. How could I have prevented this? How could I have helped so that we didn’t have to lose such a sweet boy? With reading your words, I feel I understand a little more. I will share this article with my son so that he might understand what might have pushed Jared to do what he did. He told me after the funeral, that with all the talking my husband and I have done with him, and the candle lite vigil we went to, and talking with his friends and other members of the church, that he is at a point now that when he thinks about Jared he doesn’t think about Tuesday, but instead thinks about the Jared he knew and all the memories he has of him. Thank you for your words and for the healing they will inspire. Mindy, thank you so much for your response. My sympathies and well-wishes for you and for your son. It must be so difficult for him and I appreciate how you are handling it. As you can imagine, now that I’ve written this, a lot of people have shared some of what they’ve heard and I find it deeply unnerving how much rumor is quickly becoming engraved in people’s minds as fact. I won’t dignify any of them by airing them here. Even the journal entry that has been reported seems paraphrased and maybe even slanted. I think that people’s memories of him are the most important evidence they can rely on. To me, your son’s attitude is the right one. Tune out the rumors and hype. Trust the memories. As I said, I didn’t really know him well. I was mostly an observer and admirer. My ward is full of admirable young men and young women. I’m in the stake Sunday School presidency. On the Sunday before that dark Tuesday, I visited the one youth class in my ward’s Sunday School program. The ward has shrunk so much that the entirety of the youth class constituted about eight people. Jared was one of them. I was not just impressed by Jared. I had never sat in a more respectful, attentive, and reverent youth Sunday School class. The teacher was a substitute, so it felt to me like this was the way our youth are. 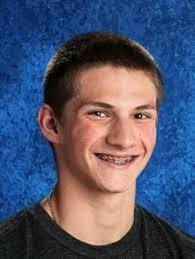 My memories of Jared will be of the smiling, friendly, and reverent young man who passed the sacrament so respectfully. I’m not saying he didn’t do the deeds of that day. I just know that I refuse to disbelieve the evidence of my eyes in favor of news reports that, no matter how accurate some of the facts may be, cannot know any better than the rest of us what went on in Jared’s heart and mind during his last hours. I want to specifically address your pondering about what you might have said or done to prevent what happened. It is a very natural feeling. For as little as I knew Jared, I have wondered the same thing. I’m sure his father has wondered that more than anyone. It was out of that feeling that I posted “Dark Thoughts”, knowing that I couldn’t prevent what did happen, but hoping that I could at least start a dialog about what can be done to ensure it doesn’t happen again. This is not a political forum, so I won’t make this about gun control pro or con. It is about how we connect with young people and help them trust adults more. When it comes down to it, in my view, all of the world’s problems are relationship problems and can be solved by improving communication.